The watch is a real eye-catcher. It is classic and I look forward to wearing it everyday! I love how the second/minute/hour hands are a metallic blue color. The watch has "bling" without saying "look at me." The price tag I got said it was originally $425! :) If you're looking for a nice, small, dainty watch, this is not your watch. The face is fairly big (well over an inch). The band is about a half inch wide. I have regular to small-sized wrists, and I am on the second to smallest notch, just to give you an idea. If you have very small-sized wrists, the band might be too big. I received this watch as an Christmas gift and was blown away by its beauty! 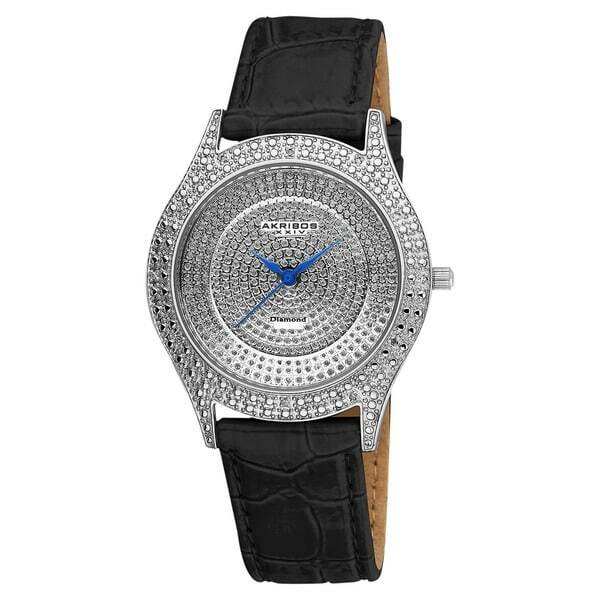 it is a very sleek watch with great glitz that gives it loads of sizzle without overdoing it. It is a very slim and comfortable watch that can be worn just about anytime you'd like. Leather strap, quality brand watch that costs FAR less than you could buy anywhere else! Quite expensive looking @ a fraction of the cost. It catches the eye. It is a large-faced watch, I have a small wrist, but fits well. Never dissappointed with Overstock's quality standard of products. I have a lot of items from Overstock and have been extremely pleased-I have rather high standards. I have to give this only three stars for now. I wanted an oversized watch that was basically plain yet a little different and was not a chain link. This seem to fit the bill. I am waiting to see how long it will continue to be in working order. The last Akribos I had stopped working and when I tried to have it fixed by a couple of jewelers, I was informed that the mechanism was broken. I will wait a few months and hope to update the amount of stars I will hopefully will give. But it is a beautiful watch and I really like it very much. To update, it is now January, 2019. The watch band must have broke during my everyday travels and now I do not have a watch. Will not buy another Akribos again. Love this watch...it is the perfect size!!!! Great price i would definitely recommend to a friend!!!!! I get lots of compliments on it!! 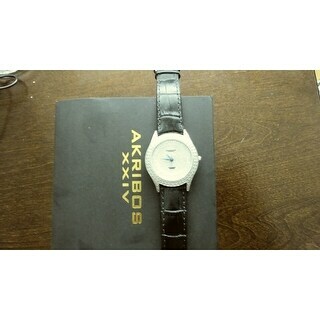 !1Nice watch!! Great anniversary gift!!! Gorgeous watch, luxurious looking, and was a GREAT deal! Where else but Overstock are you able to get a $400+ watch for $20? Nowhere! This is a beautiful watch that goes well with professional attire or casual clothing. Beautiful watch fits perfectly with everything in my wardrobe. It looks like an expensive watch. Good deal for the price. This watch looks nice on the website, but when I got it, its more of a dull, studded look unless you keep it in the light. It's also really hard to tell the time on this one. I sent it back. I love this watch and get compliments on it every time I wear it!! It has held up well considering I am very hard on my jewelry. I got this watch for my wife as gift and she loved it.For the price you can’t beat it. Not enough sparkle that I like so much. "Do you have this watch in burgundy? I don't care for black." Hello pharoh2, we do not currently have a burgundy option, we do have red if you'd like to look that over. You can refer to item number 13022317. Thanks for shopping with us!